Jet Airways chairman Naresh Goyal (left) and civil aviation minister Praful Patel at a press meet in New Delhi on Tuesday. 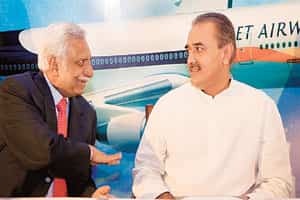 “We have applied to the civil aviation ministry to fly to Dubai, Abu Dhabi, Bahrain, Muscat, Doha and Kuwait and are hoping to get a favourable response as per the policy," Naresh Goyal, who chairs the board of the Mumbai-based aviation firm, said in an interview on Tuesday. Given Jet Airways’ current finances, an aviation analyst said, it will likely to have to raise the money by January, when deliveries for the planes are scheduled to begin. The analyst asked not to be identified because he is not allowed by his company to talk to the media. West Asian routes, despite intense price competition, have been a cash cow for India’s state-run airlines in the last three years, during which no other Indian carrier could fly there. The National Aviation Co. of India Ltd-owned Air India (which includes the merged Indian Airlines) earned a combined revenue of Rs3,218 crore in fiscal 2006, up 13% from Rs2,836 crore the previous financial year, according to figures presented in Parliament by the ministry of civil aviation. Figures for fiscal 2007 are not yet available. Air India, Indian Airlines, and low-cost carrier Air India Express together make up about 48% of the available seats on that route, and will be the strongest competition for Jet Airways and its subsidiary Sahara Airlines Ltd, which runs the JetLite service and is the only other private airline eligible to fly in the sector. Jet Airways, whose top position among Indian carriers by passengers carried is under challenge by rival Kingfisher Airlines Ltd that bought a controlling stake in Deccan Aviation Ltd-run Air Deccan in June, had been consistently profitable until it started planning international routes in the end of 2005. The company’s shares fell steeply from an issue price of Rs1,100 each when they were sold in an initial public offer in March 2005, and currently trade at around Rs825 each. Part of this meltdown came about over a botched-and-then-sealed takeover of Sahara Airlines in a process that lasted nearly a year-and-a-half before an April deal. Investors have worried over losses over the Sahara—now JetLite—integration. On Tuesday, Goyal insisted that Sahara’s problems were on the mend and the unit would turn profitable this month. Jet Airways has in the past declined financial details of the unit. I think you should ask the civil aviation minister that... whatever the government decides, we will welcome. The government will do what’s good for the country. And what’s good for the country will be good for Jet. I am talking of cooperation. The biggest airlines in the world are cooperating through what are called alliances: Star, One World, Sky King... they all cooperate with each other. I am sure if the Indian carriers will cooperate it will be good for the consumer. All these alliances are cooperation (agreements). You can cooperate in maintenance, ground handling, airports, engineering, commercial cooperation, revenue sharing on flights, adjust flight schedules. No, I don’t have a timetable. We are always in discussion with Air India. We will see.. whatever is good for both and for the consumer we will do it. So, the ball is in Air India’s court? No, I am not saying that. These discussions go on all over the world and Air India is one of them in India with us. We have cooperation with Air Canada and so many other airlines..so why can’t we cooperate with our own carriers? I am saying between Air India and Jet the market share will go to 50% (on international routes). AI is introducing new flights, we are also introducing new flights. Between us—AI and Jet Airways—we have 20-30% market share currently. There were plans for Jet to fly to West Asia. When do you plan to start? The (current) policy allows us to fly from January 2008. So we have applied to the civil aviation ministry to fly to Dubai, Abu Dhabi, Bahrain, Muscat, Doha and Kuwait and are hoping to get a favourable response as per the policy. The policy allows us to fly. Will it be Jet Airways that will fly or a low-cost, long-haul operation by JetLite? It will be Jet Airways… JetLite has not yet applied separately. Their (JetLite) management will look at what is best for them. If it makes commercial sense and shareholders’ interest, it will fly. All the deliveries of the (Boeing) 777 will finish in February 2008, all Airbus 330 in October 2008. Then we have 10 more options on 777s—three we have firmed up, seven we are in the process of firming up. We are looking to firm up 10 Airbus 330 options. Also, we have bought 10 787s and 10 options with deliveries till 2012. Do you plan to deviate from the current growth plans—in terms of inorganic and organic growth after JetLite? You said you will have a new business plan in place post 2008? I never follow competition. Jet Airways has set standards. I am so glad that our competition follows whatever we do. We work with our own business plan... it doesn’t (change) overnight. We will continue to follow a business plan like we have for the last 14 years that makes sense for our shareholders. Given the amount of money you have spent on turning around JetLite, has it become a burden to an extent in terms of the turnaround money it will require? Do you plan to sell it off? Of course not. Naresh Goyal will always (have) control as a majority. It’s (JetLite is) not a burden. It’s a win-win deal. It (JetLite) will break even in September 2007. Are you doing a due diligence for the southern carrier Paramount Airways? No, no its all rubbish…We have never thought of Paramount.